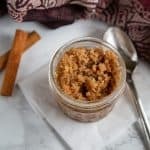 A recipe for a simple homemade cinnamon vanilla sugar scrub, a simple, inexpensive, yet decadent treat for yourself or gift for others. Every time I go to Whole Foods I wander past their Whole Body section where I’m tempted by beautiful glass jars of bath salts and body scrubs. My skin can get really dry in the winter, so I love using their scrubs to exfoliate and moisturize. Plus, they just feel like a treat during the long, dark days of winter. But these beautiful body scrubs don’t come cheap! So I decided I needed to figure out how to make my own. 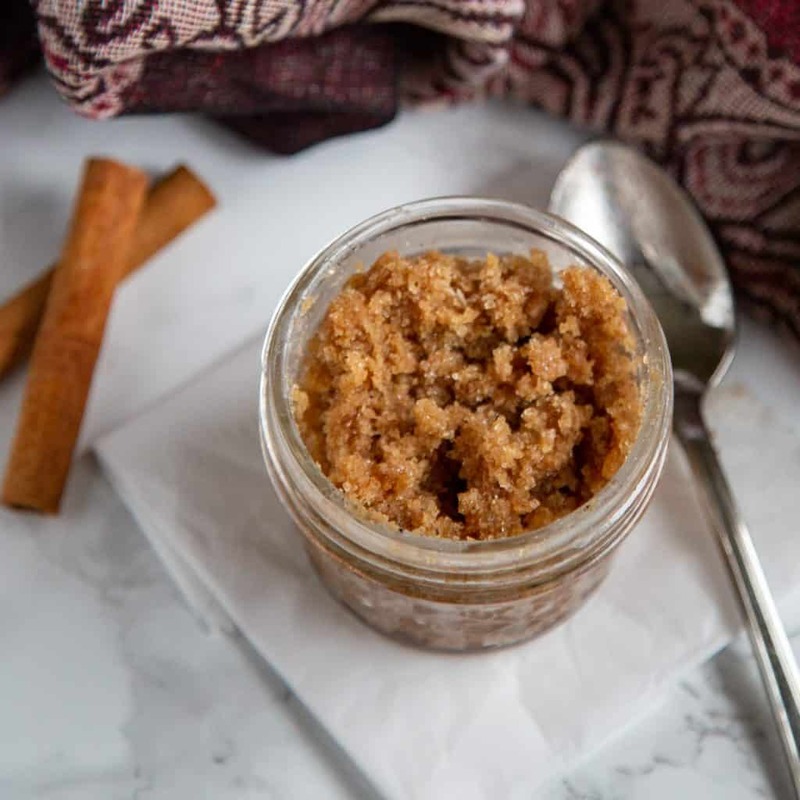 I love this super simple cinnamon vanilla sugar scrub. It smells like snickerdoodle cookies and feels so luxurious on my skin. Plus, it’s super simple to make, way cheaper than the scrubs at Whole Foods, and gives me the same shower pick-me-up that the expensive scrubs do. This sugar scrub is one of the easiest things you’ll ever make! To get the right exfoliating texture, I recommend Turbinado or raw sugar. At my grocery store, it’s sold under the brand name ‘Sugar In The Raw.’ Coconut oil provides moisture while the vanilla extract and cinnamon give the perfect smell. To make this scrub, just mix together all of the ingredients in a medium bowl. If the coconut oil is solid, warm up in the microwave for 30 seconds to soften. Store in an airtight container. I like to use 4 oz mason jars. Wrap a ribbon around it and you have the perfect gift! Or just keep it for yourself to give yourself a treat every time you wash your hands or shower. 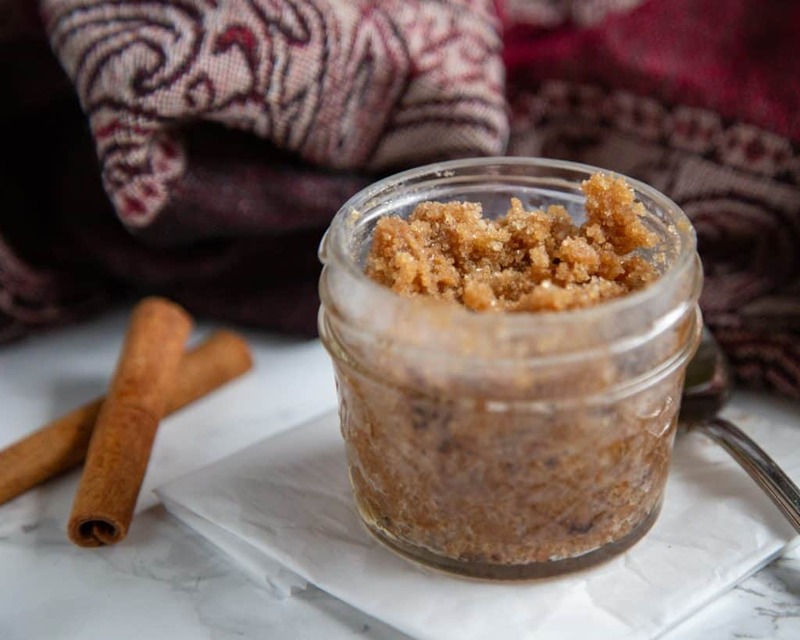 Recipe for an easy homemade cinnamon vanilla sugar scrub. The perfect gift for others or treat for yourself. Mix together all ingredients for the scrub of your choice and store in an airtight container like a small mason jar. Use about a tablespoon at a time and massage gently onto hands or body. Rinse well with water.